Of the world’s most precious commodities – gold, silver, diamond and platinum, e.g. – few would include soil among them. The fact is, however, that this life-giving, health-nourishing strata of the earth’s crust is essential for existence. The clay, organic matter and rock particles that comprise soil produce vegetation that is the staple of our food supply. Erosion, contamination and overuse have depleted much of it, making the available remainder all the more valuable. To steward the land responsibly is to grow more with less, particularly regarding gardening. Learning how to grow vegetables from scraps is a start in the right direction. In short, scraps refer to kitchen scraps, i.e. your garbage. Do not be alarmed: you will not be eating anything unclean or rotten, as you do not eat dirt when consuming a traditionally grown vegetable. The fact of the matter, though, is that kitchen scraps – potato peels, carrot stems, pineapple tops, etc. – contain all of the genetic make-up of the seeds you buy at the garden center. 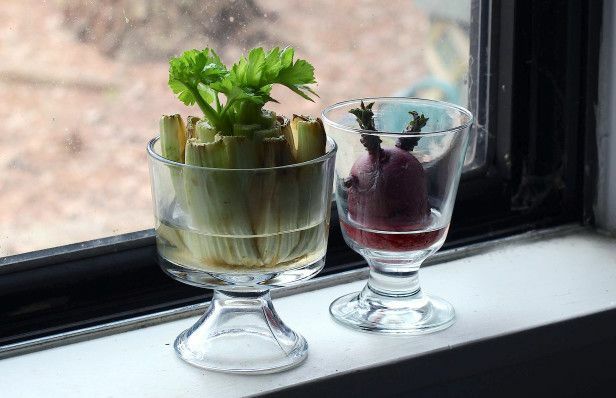 How to grow vegetables from scraps is the art of reproducing them from the parts we throw away. While many vegetables do just fine beginning in standard potting soil, some do better starting in water. Root vegetables and tubers like sweet potatoes and water chestnuts are typical of this sort. Ordinarily, denser roots will be suspended in water by a metal or bamboo skewer (a toothpick will soon break). Another option is to float lighter roots in a bowl of water. When roots grow to four inches long, they are ready for transplanting. Also important is the addition of charcoal to the water at about a one to four parts ratio. This prevents the water from getting fouled. Carrots are among the root vegetables that are often started in pebbles (with water, of course). Using a container that accommodates the appropriate number of plantings, pour a layer of rinsed white pebbles (available at any nursery) at the bottom and place the roots on top. Subsequently, surround the roots with another layer of pebbles, keeping about 30 percent of the plant above the surface. Add only enough water to reach the pebble surface. The light requirements for various plants are not uniform by any means. Too much illumination can scorch the plant while too little can leave it pale and spindly. For this reason, assessing the sun exposure is essential prior to planting vegetable scraps. Sunlight from the east, of course, is strongest in the morning but cool overall. On the other hand, southern exposure allows for many hours of light, but can generate too much heat for a given plant. A northern orientation might not afford sufficient sunlight but western exposure is optimal. Then there is the issue of surroundings: no matter from which direction the sun shines, an inner-city dwelling may experience blockage of the sun’s rays by surrounding buildings. In such cases, fluorescent lights that simulate ultra-violet rays are effective substitutes for the solar contribution to photosynthesis. As with light, the key to watering is to convey just enough moisture, but not too much. Ideal soil is moist but never soaked. Sight and touch are good indicators here: if the potting mix looks light in hue, chances are it is too dry. If you are unsure of the naked eye, feeling the soil with your fingers will quickly demonstrate whether or not watering is needed. Those tending the plants should water until it comes out of the holes at the base of the planter. Once confirmed, they do well to refrain from any more irrigation until the soil is dry. Temperature plays a role here, as well. Clearly, those vegetable scraps germinating in a warm and dry environment will demand more frequent watering than those growing in a cool, dry place. Likewise, the size and hardiness of the leaves are also factors in irrigation. Thick leaves – on avocados, for instance – tend to hold water better than their thin counterparts, such as those on legumes. When discovering how to grow vegetables from scraps, novice gardeners might forget that scrap-originated plants are subject to the same threats as every other garden denizen, namely pests and insects. Aphids, mealybugs, scale, sooty mold, spider mites and white fly are a few examples of a plant’s mortal enemies. Prevention begins with thoroughly cleaned pots; a growing medium free of bacteria or larvae; lots of ventilation; and well-scrubbed scraps, be they roots, pits or sprouts. Giving each plant sufficient space is also desirable. Should pests arrive despite your best efforts, there is still hope to save the vegetables. Soap and alcohol solutions of varying compositions, as well as organic pesticides prove effective against these parasites, especially if they are spotted early. Vigilance is key when learning how to grow vegetables from scraps. The possibilities are seemingly endless: chickpeas, artichokes, carrots, beets, potatoes and garlic are all amenable to growth from scraps. Furthermore, those who are interested in how to grow vegetables from scraps will be interested to know of the many fruits and nuts that can also be raised in the same manner: almonds, mango, kiwi, pineapple and peanuts (OK, legumes, not really nuts) also reproduce from kitchen scraps. It is worth noting that tropical fruits need more light and heat than do standard fare vegetables. 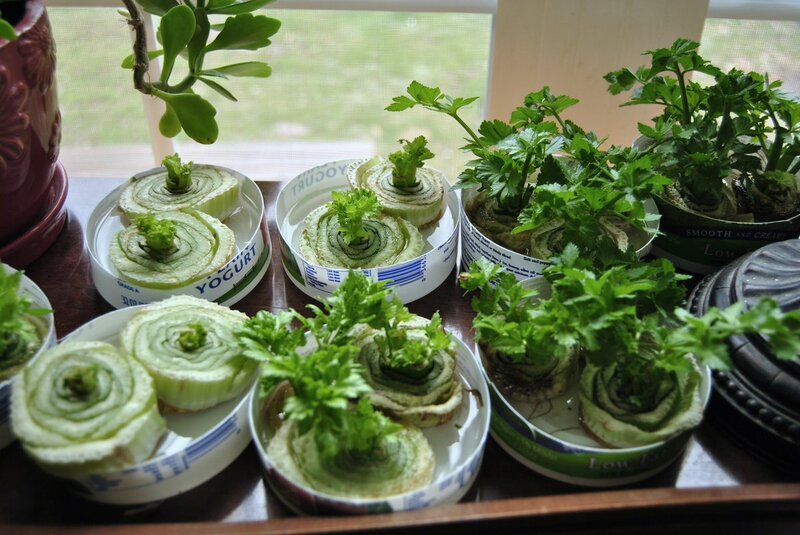 The art of how to grow vegetables from scraps is really the art of conservation. Recycling unused scraps requires less soil, less labor and fewer inputs than what commercial agriculture would demand. Another upside is that it reduces the amount of garbage produced by a single household. 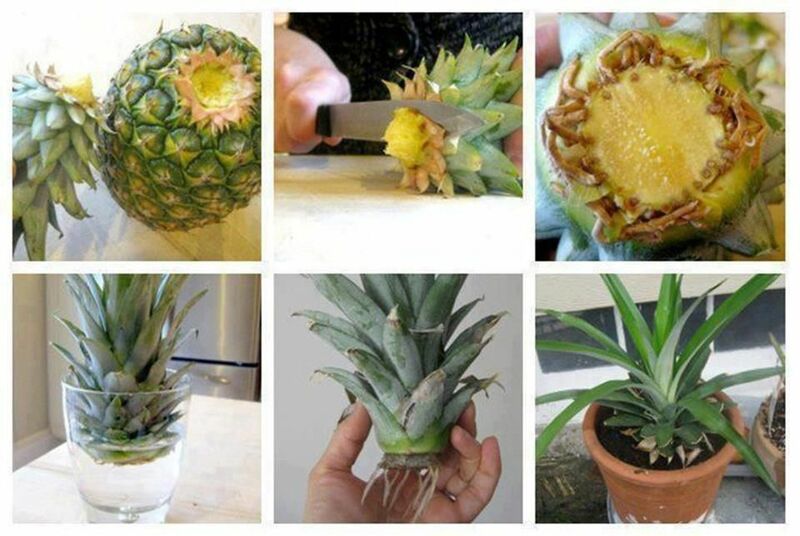 Before running out to buy produce, consider growing it yourself from the scraps you throw away. Not only does it aid the natural world, it also reduces the weekly grocery bill. Hey Buddy!, I found this information for you: "5 Tips on How to Grow Vegetables from Scraps". Here is the website link: https://backtofarm.com/how-to-grow-vegetables-from-scraps/. Thank you.